[Spotted in January 2018] There will always be things that catch my attention without necessarily earning my hard earned dollars. 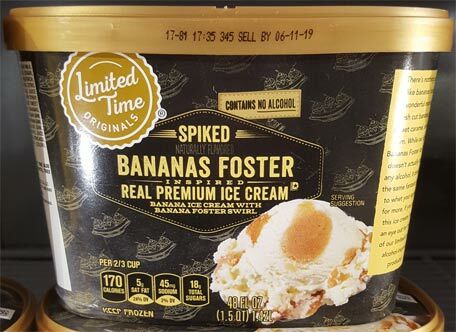 Case in point is the latest limited edition flavor from an Ahold owned grocery store (Giant, Stop&Shop, Hannaford, Food Lion, etc). Hey, you jumped passed the break? Cool. So what got your attention? The bananas? The bananas foster? The catchy black and gold packaging? Or lastly, was it the word "Spiked"? 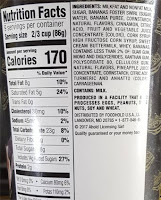 I'm afraid this "contains no alcohol", but it is part of a SPIKED line up that includes spiked mudslide muffins (wouldn't that have made for an interesting ice cream as well!). Pretty bold claiming to still have the rum flavor without the rum. As one instagrammer pointed out, New Orleans Ice Cream Company already makes a Bananas Foster flavor (which I reviewed here). That one wasn't really my thing as it uses real rum in the mix. 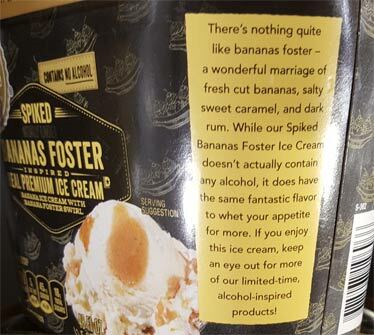 Ironically, another instagrammer pointed out that he's actually tried this already and the "rum" flavoring in the swirl isn't that strong... Do you think that you will you search this one out? I would def seek this flavor out. I think HD had this flavor awhile back and I loved it! This flavor doesn’t interest me - I hate the taste of rum. Have you heard about the new HD line? I think there is a banana peanut butter chocolate chip, midnight cookies and cream in pints again, and a honey caramel almond flavor. They also have new ice cream bars coming out soon. I can’t wait to try them all. I wonder when BJ will announce new flavors. And is Talenti only doing the low cal flavors this year? Geez, I get bogged down in work all weekeday (for my day job) and Haagen-Daz goes and updates their website.... not sure how you can put your watermark on someone else's photo but that's beside the point right now.... Anyway, once I start spotting things in the freezer aisle, the pictures will be posted here and on my social media accounts which hopefully help other people to find them as well. it's just a mix of noticing what is missing and then eventually verifying that fact when it's no longer on a companies website. Like TV shows, there are rarely "announcements" when something disappears. and by noticing I mean a mix of noticing and then also seeing "discontinued" tags, which you then have to verify if it's a store discontinuation or a product discontinuation. Bought it today and am not a huge fan. 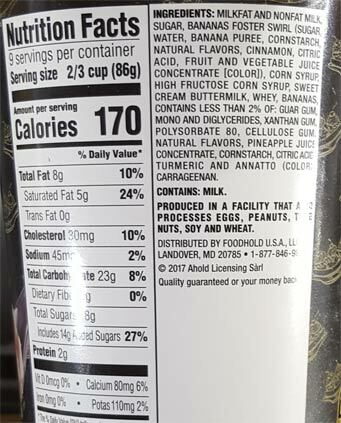 The banana flavor was too laffy-taffy tasting. I do enjoy Ahold’s commitment to bonkers flavors though. Bought it last week, and it is pretty good. I always like it when they come out with unique flavors (I thought their Blueberry Pancake a few years ago was rather interesting, if not a bit on the sweet side).